I recently discovered that one of the snow peas was not looking very well. It's leaves had become yellow and mottled. Not knowing what it was, but guessing it was some kind of disease, I pulled the plant out hoping that it would save the other 5 snow peas from the same fate. A week later I could see that the neighbouring plants have developed odd white-ish spots on their leaves, with some of the lower leaves starting to yellow. From reading some of our gardening books, I took a guess that this could be a fungal problem. 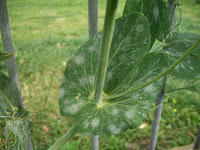 A bit of googling later and I believe we have powdery mildew, which can affect plants like snow peas and is probably the result of my late afternoon watering, a few humid evenings and the way the lower parts of the snow peas are dense in foliage which restricts air movement. I had a look for some organic options to deal with powdery mildew and found a few home remedies. The main one is a milk spray, which is 1 part full-cream milk to 10 parts water. Unfortunately, I didn't have any milk, so I decided to try another recipe, which used 7 teaspoons of bicarb soda, in a bucket of water with enough soap to make a lather. I mixed this up and put it in a little spray bottle. The other advice on powdery mildew was to remove the worst affected parts of the plants. I removed most of the lower sections of the snow peas. This will also help air circulation around the plants. The lower halves looked a little naked, but I hope it will help. The rest of the foliage was sprayed with the bicarb & soap spray. I did this in the afternoon once the patch was in shade. I've also made a note to be careful watering in the afternoon. While I water at ground level, the spray tends to wet the bottom 10cm of the plant. 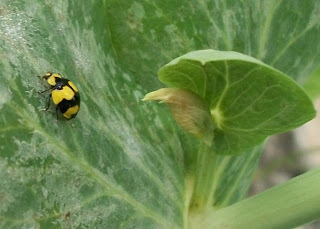 The other thing I did notice on the snow peas, w hich clued me in to the fact that it might be a fungal problem, was the presence of a number of yellow and black ladybirds. I remember from doing my first year biology bug project that these ladybirds feed on fungus. A quick look on the CSIRO entomology website and I found these little ladybirds are Illeis galbula and feed almost exclusively on powdery mildew. Definitely good bugs to have in your garden. A few days later and the spray seems to have stopped the powdery mildew from worsening or spreading further. I think I'll leave the plants for a bit to see how they go and let the ladybirds feast on the remains.